I come from a family that's never been known for its great traditions or great performances, but when I was growing up, my older sister and I began a Christmas tradition that lasted for several years. I can't remember how the tradition began, but we had an old copy of "The Night Before Christmas," by Clement C. Moore that we always liked to pull out around Christmas to get into the season. One year, we decided to put on a puppet show of the story for our parents, so we set to work making by hand all the characters and the set needed for the show. The "puppets" were a hodgepodge of Barbie and Ken dolls with their legs removed (so that they didn't seem too large), Christmas tree ornaments, hand drawn reindeer copied from our "Draw 50 Animals" book and then mounted on cardboard and a curtain rod. The set consisted of a corkboard covered in paper that we then drew a bedroom and living room scene on. In order to get our puppets to move, we tied fishing line around the necks of the Barbies and taped it onto the backs of the flat wooden ornaments and strung them up and over the corkboard. All of this was set up on the top of an old bookcase that we draped with an afghan and hid behind. The book was marked with who read which lines and we always did an introduction, announcing what it was we were about to perform, just in case our audience, our parents, didn't already know. I still have the story memorized. So each year we worked for days preparing this show. I can't remember how many years we did it for, but my guess would be at least five years. We started when I was too young to remember why we started, and our final performance reflected our age and the times. Midway through the performance, amid embarrassed pre-teen and teen giggles, we interrupted the performance with a "special report," announcing, with TV newslike attempts at drama, that President Reagan had been shot. We then returned to the originally scheduled program. For the life of me I still can't figure out why my sister and I ever did this show. The preparation went on for days at least and always resulted in fights and hurt feelings, as she and I were never the closest of sisters. 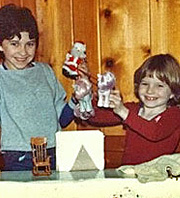 I remember the year of our final performance, we were both old enough to know we were getting too old for a makeshift annual puppet show, but the tradition was something really important to me. I never felt like our family had enough traditions, and I felt like family traditions are what draw a family together, make them close and make them welcome the holidays as a time to revel in all the quirky little things that make you a family. I'm not sure how I convinced my definitively teenage sister to do just one last show; perhaps the newscast mid-way through was our compromise. Regardless, I'm glad we had a funny tradition for a few years. So much work and bickering just for our parents! I believe somewhere in my parents house there's an old video tape of our last show, and every year I make a plan to find the tape when I go home for Christmas, but every year I manage to forget. Perhaps that's for the best. I think my memories of the great Night Before Christmas puppet show are sweeter than a very dated tape of it would be.